"Centers of Learning, Discovery and Renewal" highlighted student research from each of Haverford's three interdisciplinary academic centers. The Haverford community got a crash course in the innovations and benefits of the College's three interdisciplinary academic centers in“Centers of Learning, Discovery and Renewal,” held Thursday, October 4 from 4-5:30 p.m. in Sharpless Auditorium. The event featured a panel discussion with the directors of the Center for Peace and Global Citizenship (CPGC), the Koshland Integrated Natural Sciences Center (KINSC), and the Hurford Humanities Center (HHC), and a research symposium highlighting the work of selected students. Director Parker Snowe '79 spoke of the CPGC's offerings before turning the microphone over to Jenny Rabinowich '08 and Corey Chao '08. Rabinowich's talk, entitled“Health Care for the Poor in Urban Kenya,” focused on the semester she spent interning with WOFAK (Women Fighting AIDS in Kenya), which was founded in 1994 by HIV-positive women in Nairobi.“Working on issues I care about, I found my passion, and saw how it could manifest in my life after Haverford,” says Rabinowich, whose experience has inspired her to write her senior thesis on positive images of HIV. HHC director and Professor of English Kim Benston outlined Humanities Center programs and introduced Jacob Carroll '09 and Mari Christmas '08. Carroll was a research assistant for Assistant Professor of English Theresa Tensuan, helping her with Breaking the Frame, her book in progress about autobiographical comics.“Working with my professor and building a close relationship with her has allowed me to look within myself and broaden my perspective on this topic,” he says. 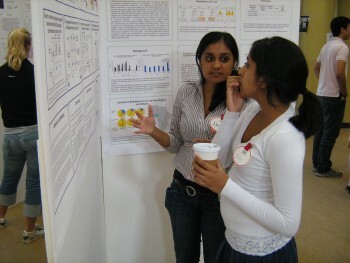 After the talks, other students from various disciplines presented their research at a poster show in Zubrow Commons. Topics ranged from the development of a flash animation tool for conjugating verbs in foreign languages to an analysis of the efficacy of treatment protocols for people infected with the Ebola virus.